Congratulations to the St. Paul Catholic Elementary School ​junior Lego Robotics team that earned Gold at the Halton Skills Competition on April 9th​, 2015. 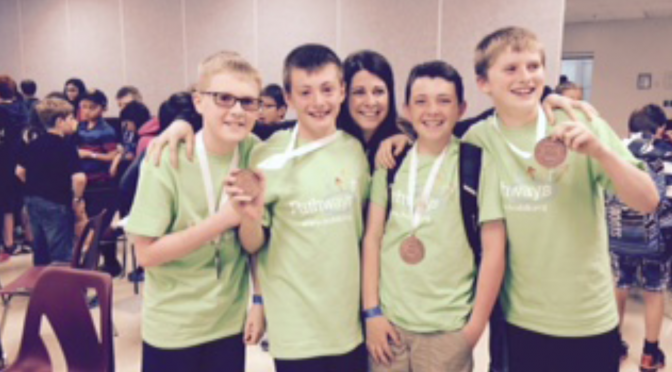 Earlier this month, the team moved forward to earn a Bronze medal at the Skills Ontario Competition on May 4, 2015! At the provincial level, the junior team members participated in several challenges that included applying their knowledge of how to use reflected light intensity, how to use a variety of touch and ultrasonic sensors to program their robot, as well as using their mathematic skills to carry out tasks. Teams were also required to write a quiz based on programming scenarios. During the Halton Skills Competition, junior team members programmed their bot to complete seven tasks – from following a line, to dropping basketballs into nets using an arm designed by the team. The unique activities coordinated by the students, as well as their knowledge of programming and strong collaborative skills resulted in excellent finishes for the junior team at the local and provincial level!